Are you getting ready to go back to school or college? 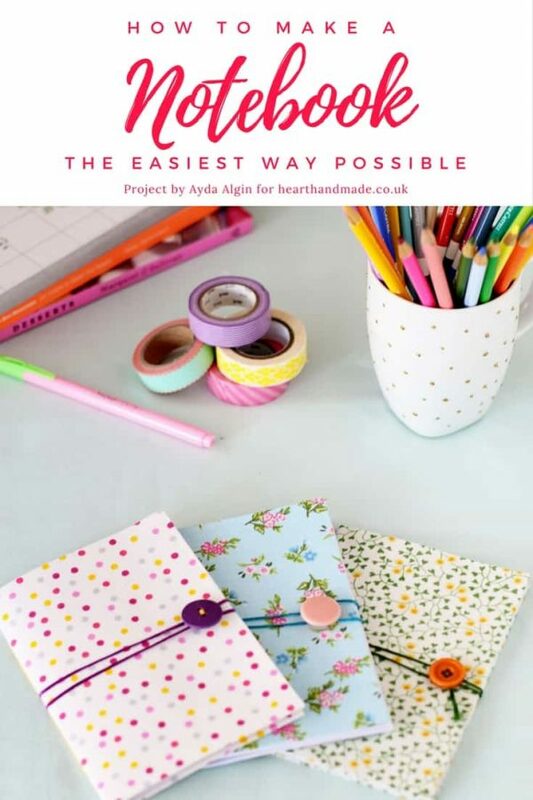 Find out how to make a notebook with Ayda! 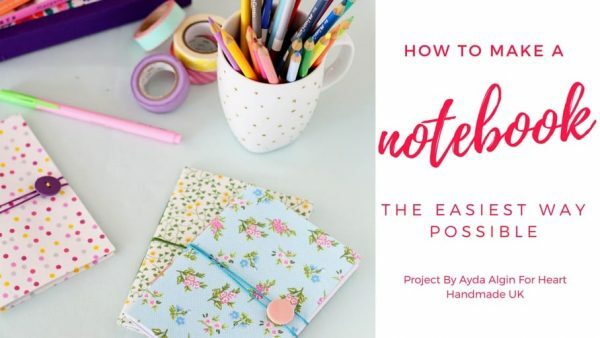 We are so lucky to have this guest post by Ayda Algin of CafeNoHut who teaches you how to make a notebook out of a cereal box, graph or plain paper and material into super cute, useful notepads and scribble pads. The project is so simple to do, so even the kiddos can help! 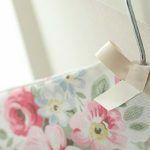 Set aside a little box for collecting scrap papers, paper bags, scraps of pretty gift wrap or even wallpaper samples so that you can put them to good use! Paper; graph paper is a great idea because you will be taking a large sheet and folding it in half, meaning you can use it as a lined notebook. The same applies for Dot Paper (my favourite) or plain printer paper. I don’t recommend you use lined paper as the lines will be facing the wrong way to use as a lined notebook. Decide the side your notebook will be and cut up your cereal box to use as backing. You can use this as a template to cut out pages or to the size of your choosing (remember they will be folded in half). Add as many or as few pages as you wish. You can mix and match papers and textures or stick to one kind. 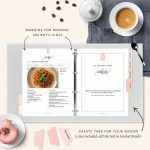 A cute idea could be to use a border punch to create an adorable cut out border edge on the pages. If you’ve ever wondered how to make a notebook with fancy edges, you can recreate the look by using a punch like this oneor your Cricut machine. 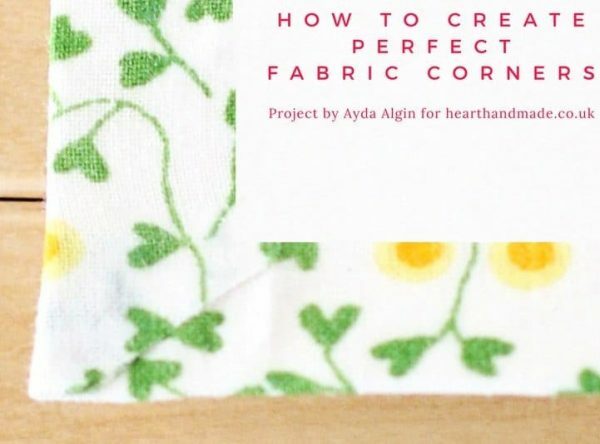 Decide how big your piece of fabric should be. If you don’t know how to do this; lay the fabric over the cardboard (piece of cereal box) and add an inch the whole way around your cardboard template. Then cut. Apply glue or use the industrial style double sided tape to the inside of the patterned fabric or on the outside of your cardboard cover. Smooth the material over the glue and use a brayer to roll out any air bubbles. Fold your corners as you see in the images. Use a hair dryer on a low setting to dry your glue a little faster. Please forgive this very rough diagram! Hand-drawn by Claire using her iPad Pro , the ProCreate app and the Apple Pencil . 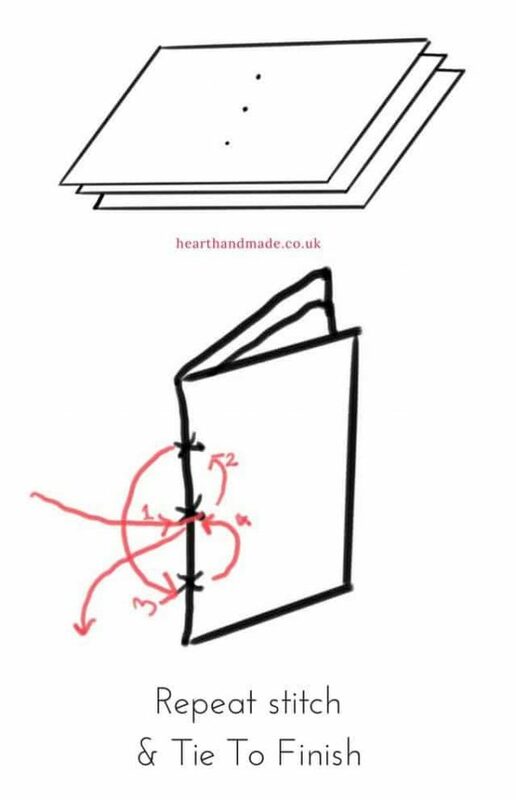 Fold and stitch through the centre of pages to bind them together and create a spine. Use the image as a diagram. 1.Insert needle and thread in the middle hole. 2.Go up to the top hole and back out. 4.and back up to the middle hole. 6.Tie a double knot to finish. Grab some more thread or yarn and a beautiful button. Figure out where your button will be placed and stitch it onto the cover. Cut a long piece of yarn and use it wrap around the book and keep it closed. The notepads are now ready to use! Woo! You can make more than one obviously, especially if there are lots of subjects that could you (or the kids) could use them with. 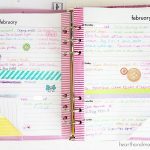 You can always embellish the front of your notebook with labels, beads, or scrapbook embellishments. The possibilities are endless, and you will have fun experimenting. Now that you know how to make a notebook, how many are you going to make? I’d be thrilled if you’d like to connect with me! Very pretty! Maybe a cute notebook would help me be more organized and “on it”, lol! Visiting form Home Matters party. 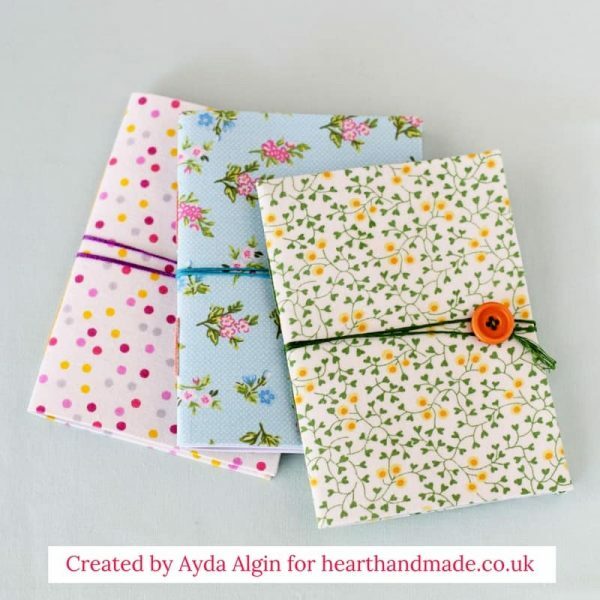 Such a pretty idea to make these notebooks. And they make awesome gifts too. Claire I will be hosting a round up next week and would love to use your project. I will use one photo and link back to you. Let me know if you are up for it. Ok done. It is up on the blog now. Thanks Claire.